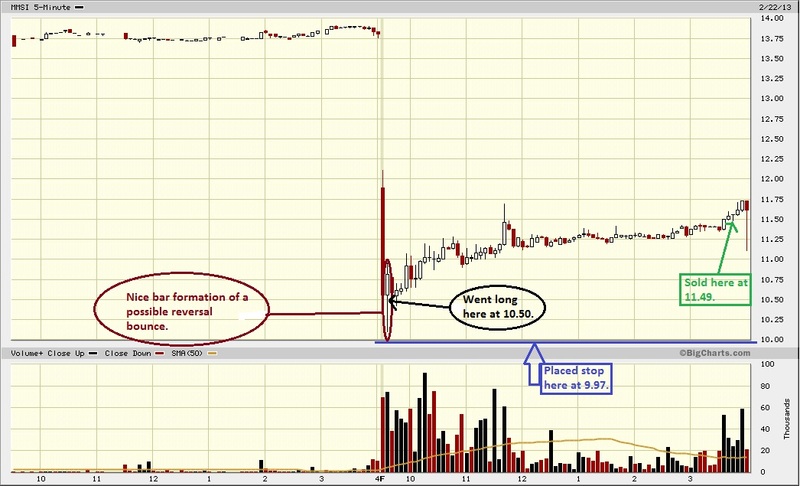 TRADER 9: Trade of the day, MMSI!!! Took a huge gamble today on MMSI when I placed my stop at 9.97, after going long 1000 shares at 10.50. It had a very strong support level around the low 10's. It formed a nice candlestick hammer bar about 10 minutes into its' trading and bounced off that key support level, so I knew it had a great probability of retracing back up today. Sold it at 11.49 about 15 minutes before the close, for a .99 point gain. Have a great weekend!